February « 2012 « How Do You Measure 525600 Minutes? What could be more American and apple pie than Friday night with the guys? Blowing off steam at the end of week, joking and talking about family, work, politics, home improvement, Broadway musicals….. WAIT! What was that last one? That’s how I spent last night and how I’ll be spending my Saturday…. building sets for Bartlett High School’s upcoming production of RAGTIME… working with a great bunch of guys. Probably one of the biggest benefits of my job is that it gives me a chance to meet and work with a whole different group of people. It’s my male-bonding time. Not an exclusive club, women are always more than welcome to participate but every year it seems that a great group of guys come together to form a tight-knit group with one goal in mind: building a great set for the students. The socializing is just one of the benefits. This year, I think we have six guys returning for anywhere between their second to thirteenth year. (There’s actually one guy that has helped out, in some capacity, with every musical we’ve produced at BHS.) Over the years, volunteers come and go but some stay beyond their kid’s graduation. Why? I think the main reasons are that in addition to building a great set, it gives guys a chance to be creative, use there hands, be a little experimental and just be themselves. It’s a wholesome, laid-back atmosphere… and a great way to learn some new skills without the pressures of producing a perfect end product. In theatre, you frequently hear about the 30 foot rule. (The average distance of the audience from the stage.) So the work doesn’t always have to be perfect, it just has to appear to be perfect from a distance. AND it has to be safe. This year, as I’m sitting in the director’s chair for the first time at BHS, it’s great to have been able to turn over the reigns of set construction to one of our very talented and skilled Dads. I’m still overseeing the project as part of my job but I feel some of the pressure is off with the greatly appreciated help. Last night we built bleachers, prepped to build a stage extension and gutted an old piano. Good times. So far this year, I think we’ve had three or four new volunteers join the club. As we start to pick up steam, I’m hoping we get more new people involved. If you’ve never volunteered before, I highly recommend it. What you learn and the friendships you develop can last a lifetime. 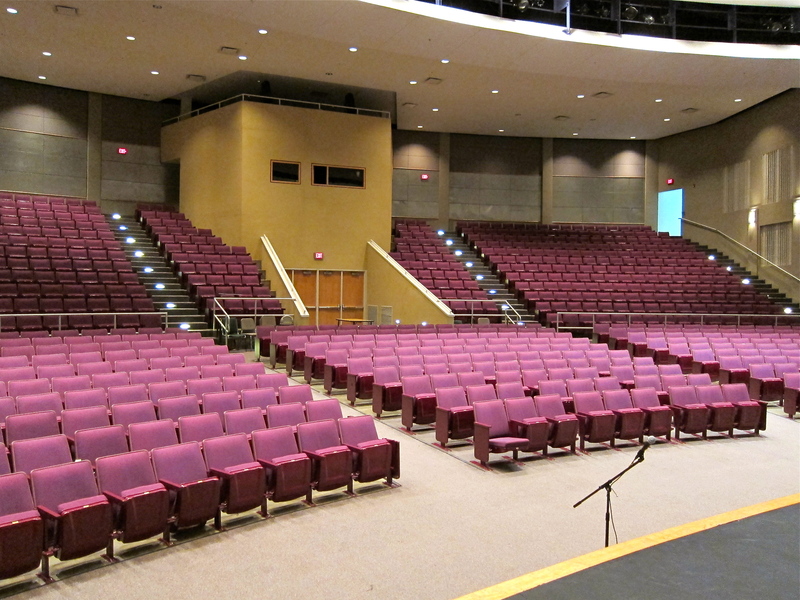 Bartlett High School Auditorium. For the next two months, I'll see this view, far more than my own home. 5:30 am Monday morning. It stinks! No, seriously, it really did. I was pouring my second cup of coffee yesterday morning and I heard Michael letting the dogs out as he came downstairs. I took my coffee and went outside to supervise my little trouble makers… just in time to see a menacing little creature crawl under the front gate and start his way up the driveway. Luckily, the dogs were in the back. I grabbed a shovel and made sure I got the little devil’s attention before approaching and heading him off… trying to prevent a Monday morning catastrophe. He stopped in his tracks…. tail went up… he turned and trotted back the direction he came from. No smell. I saw him disappear across the street and was quite proud that I had averted a disastrous start to the week. Michael came out with his coffee and I proceeded to tell him how I’d saved the day. Before I could finish my story, Cash and Roxie started barking… and sure enough… that little vagabond was back. He’d gone around the block, down the side of our property and was now trapped between the fence and electric rolling gate… tail up… dogs at full attention. We were able to get them away from the skunk pretty quickly. Probably because they hadn’t had their morning biscuit yet, let alone breakfast. Yes, they got sprayed — but not as bad as usual. I wiped their faces with paper towels to see how much skunk oil they had contracted and luckily it wasn’t a direct hit. Still, we get the pleasure of two walking room odorizers that will disperse their lovely fragrance, constantly, for several weeks. The dogs got sprayed at least a half dozen times last year. A winter confrontation is pretty rare though. As annoying as it is, we’ve gotten used to it — and honestly, the smell isn’t that bad when you’re accustomed to it. The kicker is that it always happens at the most inopportune times– like right before work or when we’re planning to have guests over. We’ve tried all the home remedies and over the counter products and found the best solution is liquid Dawn. It cuts the oil and eliminates the most smell. Tomato juice and vinegar work to some extent but usually just make the dogs smell like a skunk salad. Cash usually gets sprayed the most and its really hard to get all the oil from his face, leaving us with weeks of skunk kisses until it wears off. End of story: I could have let it ruin my day. I have to admit, I did think to myself, “Great start to the week“, but I wasn’t going to let it rule my mood. Aside from being a little annoying, I wasn’t going to play victim and went on to have a pretty productive day. Winter Sunset. 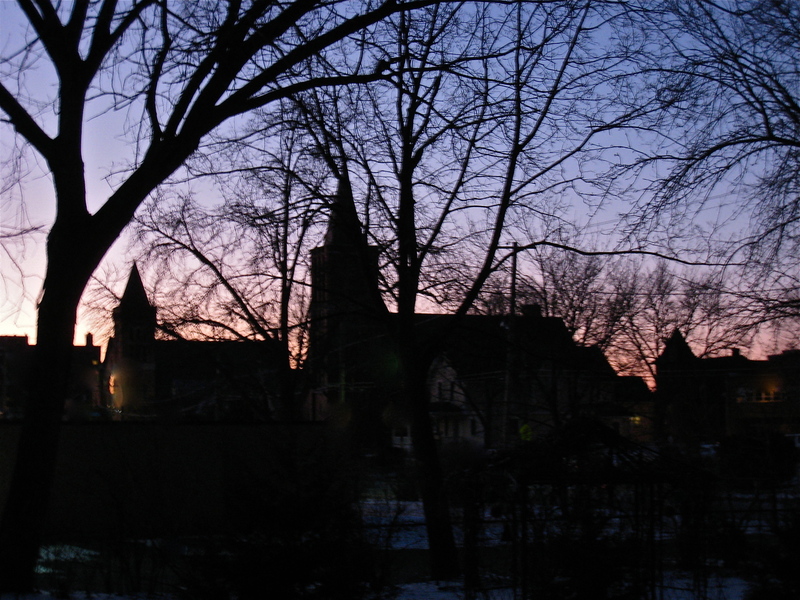 The view of downtown Elgin from our yard. 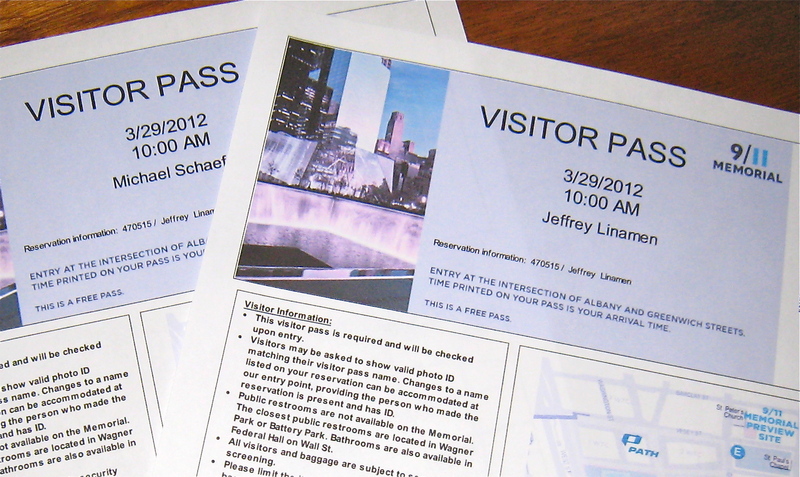 I just finished reserving my passes to visit the 9/11 Memorial in New York City, March 29th at 10 am. I’m hoping the cast of September’s Heroes will want to help make a small tribute book that I can leave there. Suddenly I find myself full of raw emotion, my eyes filled with tears and completely overcome. September 11th, 2001 is the single most influential event in my lifetime. I’m not completely sure why the thought of it has such an overpowering effect on me. I just feel so connected. Now I need to stop crying and go to rehearsal. February 8, 2012 5:48 AM / 1 Comment on Chop or Trim? When you compliment and criticize or clean and organize… do you Chop or Trim? When you cut your hair do you trim and maintain it or chop it all off for a drastic new look? What’s your approach? Yesterday morning I opened the door to take the dogs out and was greeted with the sawing and grinding sounds of the machinery used to trim back the trees from the power lines. I found this somewhat odd since the company had already been through our neighborhood in November and December. I walked around the front and sure enough, one guy was up in the bucket, another on the ground, vigorously attacking tree limbs. And I mean ATTACKING the tree limbs! I’ve always questioned the way the city (or its sub-contractors) maintained the trees around the power lines. I completely understand the need for the them to coexist in a way that the lines are not disrupted, but the way the trees are trimmed has resulted in unhealthy, gnarled and disfigured specimens. Most of them are downright ugly. It appears the objective is to chop out the center, or the heart of the tree, leaving an unbalanced V-shaped wedge. Now keep in mind, over the years Elgin has proudly touted its historic tree-lined streets. They’ve even received national recognition for it. Today, there aren’t many left. When we moved here 13 years ago, we had six trees growing on the parkway (the area between the sidewalk and street), five of which were around 60-80 feet tall. Of those five, none of them have looked especially healthy, and it took three years of phone calls to convince someone that one, with a decaying hole clear through the trunk, needed to come down. We now have three left. The youngest, shortest of these, was the one being attacked the other morning. The workers didn’t prune or trim it… they chopped and hacked it. 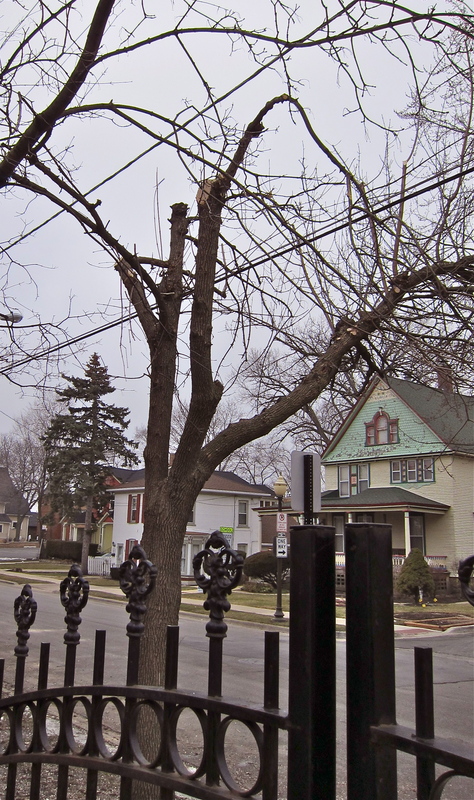 They removed nearly all the upper branches, there is no longer a heart or crown, but they left one curved branch that extends below the power lines over the street. When they were done, the one that had been removing all the branches, stood back and examined his work and said to the other, “That doesn’t look good”. To which the other man responded, “You did it. I told you it was too much”. The first guy then shrugged and said, “It’s just a tree.” and they went back to work. Though I don’t think they killed it, it is definitely disfigured for the rest of its years. I’m not sure what kind of tree it is but it is not not one of the common Maples that are in abundance. This tree had a nice healthy shape and for the most part, the main branches were no threat to the power lines in its reach. Now, what if this tree were a person? What if instead of saws cutting branches, it was words cutting into someone’s personality, looks or work ethic? How much damage could those words do? Will they permanently disfigure their target? Will they promote healthy growth? Do you Chop or Trim? I’m sure most have us have heard it at some point in our lives: “Why are you here?” or “Why aren’t you ____?” Or “So what’s holding you back?” I can’t think of a better way to invalidate someone’s life. Sometimes these questions are intended as compliments — insinuating that you could do, or deserve better. Sometimes the question is more pointed: “(If you’re so good) Then why are you here.” My new response is going to be… “Walk a mile in my shoes and then ask me that question“. I had the chance to meet and catch up with an old friend (and former student) the other day. We reminisced over the ‘good old days’, played where are they now and talked a lot about where our lives have taken us. Cristen is a beautiful, petite, fireball who’s not afraid to tell it like it is… which is probably one of the reasons we hit it off. We both get in our share of trouble for being a bit too honest at times. Cristen used to keep me company while building sets at the high school. The auditorium was her safe place and where she’d go to blow off steam. 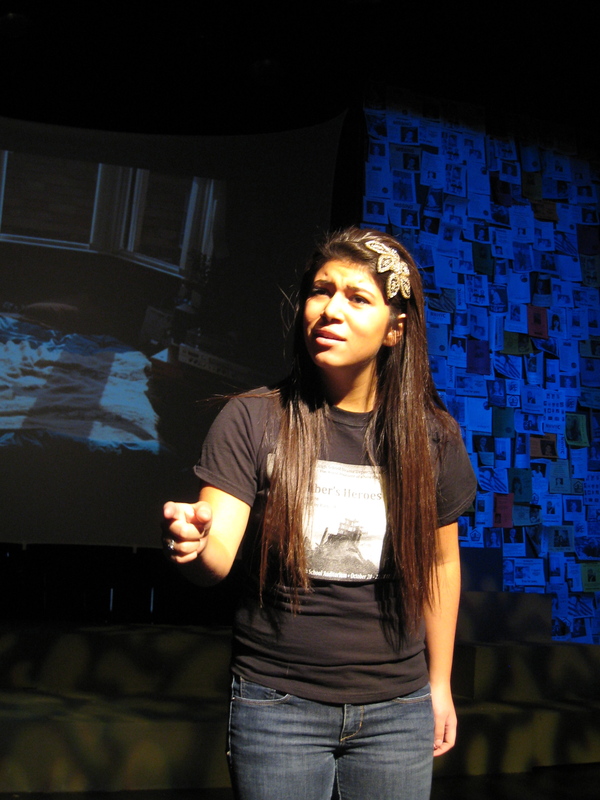 In those days, she dreamed of being a performer but when she got to college, it no longer seemed like the right fit. The passion had waned. Now, she finds herself, the wife of a choir director in a sleepy Missouri town with endless tales of small town life. I remember our phone conversations when she was in college about her decision to change career paths. I remember feeling a little sad but wanting what was best for her. Talking with her about it now, it all makes sense. But at the time, I just hated to see someone so passionate, give up on her dream. I never judged her for it and I wasn’t really sure if she was looking to me for guidance, acceptance or confirmation of her decision. All I wanted was for her to be happy. The important thing is that I couldn’t possibly understand where she was– because I was not walking in her shoes. Cristen was getting good roles in college right off the bat, so the decision wasn’t based on a little rejection, it was something deeper. The important thing to me was that her choices were her own and she was confident they were the right ones. How can you not respect that? In my own life, I’ve made a lot of choices that have raised eyebrows and received a lot of critique. Do I think I’m talented? Yes. Do I think I’m good enough to play in the big sand box? Well, yes, to some extent — but on my terms. I’ve had the opportunity to work with a lot of different artists in many situations and the bottom line is that I’m too emotional and opinionated to play with most of the big boys. I wear my heart on my sleeve. In the professional world, especially in the performing arts, you have to have a really thick skin when it comes to defending your work and negotiating. I don’t have that thick skin. I have to love what I do to be creative. I’ve always found it hard to take on a project for the money, or even just to build my resume. If I can’t get emotionally involved in it, then it won’t be my best work. I remember being offered the opportunity to direct Camelot years ago, and my initial thought was, “Ick!”, not my type of show. I guess they really wanted me, so I listened to the score and read the script but it wasn’t until I watched the movie that I found my connection. It was a momentary glance between Guinevere and Lancelot that suddenly grabbed me… and not only made me agree to do it, it made me incredibly passionate and excited about it. If I had not taken those specific steps to get to that point, I would have missed out on a rewarding experience and never grown to love that show. Through my experiences, I’ve built up a lot of calluses and the soles of my feet are thick and worn. I’m more cautious about my steps and walk proudly through each day, knowing I’m where I need to be at this moment. I still take chances, I still stumble… but each time I get up, I’m stronger and wiser than I was before. It’s my journey– my road– and the only person with the right to question my path is me. 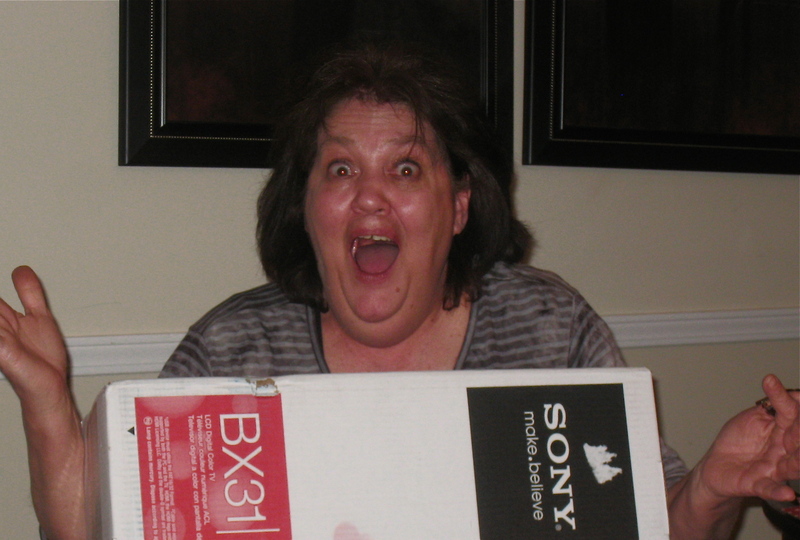 By the way, Cristen shared with me that she’s started taking voice lessons again and is loving it. Where that will lead? Only she knows. Today’s Pic: SHOES!!! 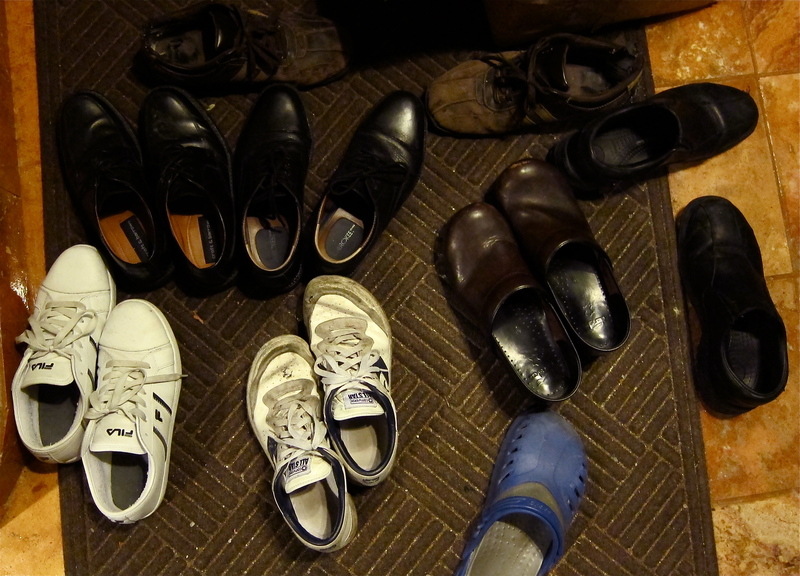 Michael’s and my shoes in our pantry/mud room. February 4, 2012 7:18 AM / 2 Comments on What Is A Family? Monday night we had dinner with Nicole’s family before they moved back to Texas. Over the course of conversation, Nicole gave me flack about slacking off, not blogging every day and asked why I hadn’t mentioned her in my blog. So here it is Nicole… you’ve been blogged! Wednesday morning we said our goodbyes. 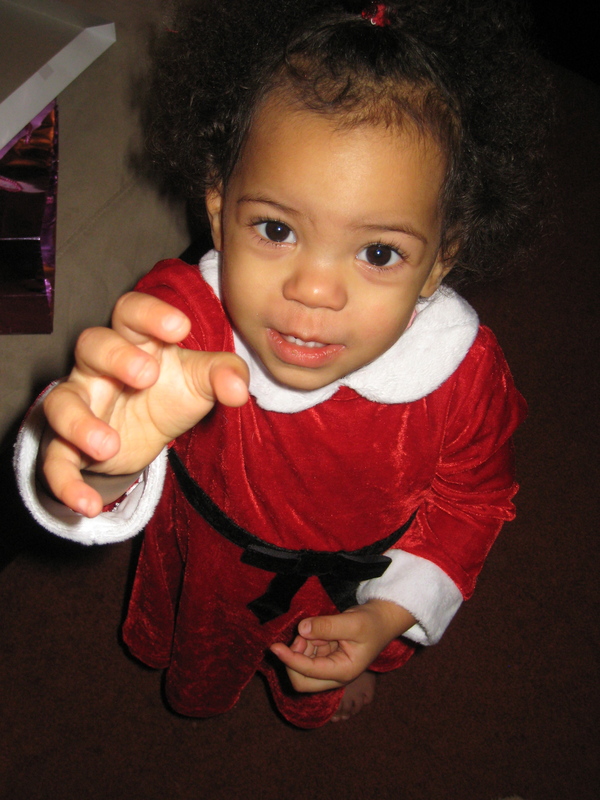 I played peekaboo with 2 year old Alana, one last time… wondering if she’d remember the next time I see her. (Her mom, Peggy, kept saying, “It’s only been an 18 month visit”.) They loaded in the car to head for the airport. As they pulled out the gate and I walked back around the corner of the house to go inside, I’d be lying if I said I didn’t suddenly get a little teary-eyed. A lot of years and milestones have bonded us all together. Webster’s definition of family includes: “the basic unit in society traditionally consisting of two parents rearing their children; also : any of various social units differing from but regarded as equivalent to the traditional family <a single-parent family>”. I say family, like love, defies definition. Happy and sad… the good and the bad… your FAMILY are the people that stick by you no matter what. Family has a much broader meaning today than when I was growing up. It’s much more than blood ties or marriages. I know there are still people that only believe family is family but they are missing so much. I guess a lot has to do with how you want to look at your relationships and how set you are in defining with labels. In terms of definition, today, most family units are labeled as broken or dysfunctional if they don’t meet certain criteria and fall in the category of a healthy family environment.We’d all be better off if we didn’t try to put everything neatly in little boxes. I would prefer to define family by the bonds that exist… many unexplainable… that forever tie us together. With a divorce rate of more than 50%, second marriages, the addition and deletion of spouses and siblings’ families…the legal family constantly changes with time. Today the chosen family plays an important role in the broader definition, creating a rich network of relationships; adding to, or replacing the traditional family unit. I really hate the term ‘chosen family’ because I think it’s something that happens, not by choice. It’s just destined to be. Alana wanting my camera to take her own pictures. I don’t want to water down or down play the meaning of family by any means. Often we may refer to a group of people we associate with as family in order to show bonds and commitment… theatre family, church family… business leaders are infamous for referring to their companies as families. (Who treats their family the way some companies do?) Those relationships are not the true family I identify with the most. My own biological family was scattered around the country over the years but have now all settled back in Central Florida where I grew up. (Except for me… still the wayward child living many miles away.) We usually see each other once or twice a year and keep in touch by phone and social networking. (I’m far more aware of what my family is doing through Facebook than I was before it existed.) Michael and I have considered moving down there– but now that Michael is running the family business, that isn’t an option anytime in the near future. So now Nicole is back in Texas getting settled in her house that she so desperately missed. (No redecorating phone calls yet?) Alana will probably forget our games of Peek-a-Boo and Itsy-Bitsy Spider… Peggy is already planning her next trip down and hopefully Michael and I will be able to plan a visit in the near future. In spite of the distance, they are here in our hearts. Family is important. The bonds are unlike those of most other relationships… the history, understanding and the support. I’ve been very blessed to have these people in my life. I was told repeatedly after coming out that I’d have a sad life with no family.